With Rift Rivals in the rearview mirror, we’re finally back to standard Summer Split competitive play. Week four is upon us, so we’re nearing the very middle of the Summer Split, and an overall power ranking is starting to materialize. With four weeks of competitive play, we can – with enough confidence – predict what’s going to happen overall, and who has the potential to reach the playoffs or even the finals. That said, nothing is set in stone and we could still witness one of those miraculous uprisings like last split with H2K and the Unicorns of Love. H2K vs. Team Vitality – For our first match of the day we have a pretty straight-forward, unexciting clash between the worst team in the region (H2K) and one of the better ones. Vitality finally got back to their winning ways in week three, and they’re looking like a very solid Top 4 team. They’re not that diverse when it comes to team comps and just ways to play the game, but the things that they do well they’re really excelling at. They also have a volatile early game – “feast or famine”, and it works for them more often than not. The only question for Vitality this split is whether or not they have the tools to contest for a Top 3 spot. In short, this should be an absolute masterclass from Vitality. They don’t need to do a lot of things right in order to get the win here, showing up on time might even be enough. Even on a bad day they have more than enough tools to outclass H2K on all fronts – both as a five-man unit as well as individually. The only question is – how long will it take H2K before they make a couple of cardinal mistakes and lose the game? Will it be five minutes like against Misfits, or perhaps a couple more? Unfortunately, there aren’t any promising signs for H2K, especially not in the current meta. Shook isn’t really that impactful any longer, they’re all playing worse individually, and with Sheriff not playing hypercarries, they don’t really have a win condition. It’s a sad sight to behold, and while they might be able to upset a team or two in the weeks to come, they’re still poised to finish at the very bottom of the standings when all is said and done. Giants Gaming vs. Schalke 04 -Another fairly unexciting clash overall. It’s a fight between two middle-of-the-pack teams, and winning this clash doesn’t really improve anyone’s stock value. That said, Giants are in a need of a win. They showed some understanding of the current meta, and they’re pretty okay individually, but they just weren’t able to translate over their strengths into a consistent level of play – and that’s a problem. They only have a single win from week one, and five losses, so even though they have a grasp on the meta, they really didn’t show a lot on the Rift, and they’re just one win ahead of H2K. Will they be able to take Schalke down? Probably not. Even though Schalke isn’t doing much better with just two wins and four losses, they actually managed to go even with the majority of the teams they played against. They also look a lot more proactive in their games, they have a solid gameplan that they try to execute from the very get go (except that one game against Misfits, they were just utterly lost in that one) and they’re making the right plays at the right time – at least when compared to their Spring Split form. They’re far from a top tier team, and whether or not they’ll be able to reach the playoffs remains to be seen, but they showed some promise over the first three weeks of competitive play, and that’s more than enough for us to give them the benefit of the doubt. Amazing in particular looks like the perfect kind of jungler for Schalke, and when he gets his hand on a champion that can engage and quickly follow-up, he’s able to set-up plays and teamfights the way Schalke wants, and that’s a serious edge over Giants. Schalke should be favored in this one, and they should be able to take the win. They showed more overall, both as a team and individually. ROCCAT vs. Unicorns of Love – We continue the trend of unexciting games, however this time around we at least have a clash between two middle-of-the-pack teams that are often able to punch way above their weight. The Unicorns are currently in a limbo-like state. They showed some really good things on the Rift, both as a team as well as individually, but their play is still fairly inconsistent overall. They have two wins and four losses but to be fair, they had a very, very rough strength of schedule. They only didn’t face Fnatic out of all top teams, so they should be able to pick up wins over the next couple of weeks. ROCCAT are sitting a bit more comfortably in the standings however, with three wins and three losses. They’re also incredibly hard to read right now because the majority of their strength lies in the early game. If they start off strong, if they get the lead they need and if Memento picks up a couple of kills, then ROCCAT has quite a big chance to win. If, however, they fail to start as well as they have to, they kind of just crumble. They have a very good read on the meta overall but they’re not always playing well enough to be competitive. So they beat Team Vitality, H2K and Giants, but they lost to Splyce, G2 eSports and Schalke. They’re looking like a fairly solid mid-tier team, and that’s perfectly fine. This is a very tough match to predict because it can really go either way. Which team throws the least will emerge victorious, it’s as simple as that, and in the last couple of weeks, the Unicorns of Love showcased a bit more proactivity and strategy, so we’re going with the boys in pink. Splyce vs. Fnatic – This is where things get a bit more interesting. A clash between our Spring Split champions and the third best team – that’s a bottom three team at the moment. Both teams competed at Rift Rivals, and it was obvious that Fnatic was the stronger, more layered team – as was expected. What wasn’t expected, was that Splyce was able to pull things together and actually win against Team Liquid on the very last day of competition. They looked absolutely incredible – determined, proactive, they fought for small leads and then quickly snowballed through all avenues. They also played incredibly well on an individual level, with Kobbe going for Heimerdinger and Nisqy one-shotting people left and right on Zoe. It was a fantastic sight overall, and it goes to prove just how strong Splyce can be – if you give them time. They have the tools at their disposal, they just need to “re-learn” how to use them. Will they be able to do so against Fnatic this week? Fnatic are currently playing at a very high level overall, both with sOAZ and Bwipo in the starting line-up, and they’re showing no signs of stopping. They’re still a bit rough around the edges, and they make mistakes from time to time but they have the edge in almost every single way. That said, Splyce should be able to make this a fairly competitive scrap if they come prepared. Seeing how they were able to take down the best team in North America, they should have a lot of confidence and momentum right now, but it’s still too early to give them any benefit of the doubt. Misfits vs. G2 eSports – You could really sleep through the first four matches of the day, but you absolutely have to watch the final game – which is also the game of the week for sure. A clash between two 6W-0L teams, a fight for sole possession of first place. This is a fight between the two best teams in the region – in the current meta. They showcased absolute superiority when it comes to the pick and ban phase, the early, mid and late game decision-making as well as individual performance. They can play standard, they can go for funnel comps – they can do everything. G2 has perhaps shown best funnel-comp usage out of all Western teams, and it’s an advantage that they can utilize regardless of the opponent. But Misfits are no slouches. In fact, Misfits hold the edge in almost every measurable statistic. They have an insane 4.07 kill-to-death ratio, meaning they get four kills in exchange for just one. They have the best early game rating, second best mid-to-late game, a 100% first blood rate, highest first turret and first three turret rates as well, but the moment where it becomes completelz incredible is their average gold lead at fifteen minutes – a staggering 5.1k gold lead. That’s an incredible statistic, no matter how you spin it. They just have insane fundamentals all-around, and they’re fast to react to what’s happening on the Rift. They’re the most proactive team in the region and they’ve shown little to no errors that their opposition could exploit. While G2 aren’t far behind when it comes to statistics – they are second. That said, their wins have been so dominant and clean, that it’s hard not giving them the benefit of the doubt. They have all been performing so incredibly well on the latest couple of patches, and they also have the best and most consistent performing top laner in the region. Wunder has been playing out of his mind lately and he made beating Impact and Huni look like child’s play. It’s impossible to give a prediction with full confidence, as both teams look rather unbeatable right now. Misfits were always Fnatic’s kryptonite, but not G2’s. Whenever they went up against G2, they failed to put up much of an offensive, and that’s a stylistic thing. We’re going with G2 on this one, but in reality it can go either way. G2 have always been able to clutch things out against Misfits, and they’re coming in with a ton of hype and momentum after wrecking North America at Rift Rivals. Unicorns of Love vs. H2K – UOL started off yesterday’s game with one of the worst invades of the split. It was intense for a few seconds, but after they couldn’t really get the start they needed, they refused to back off and in doing so they essentially threw the game from minute one. Ten minutes later, they were already down two thousand gold, and Memento was getting the kind of lead he needs to smurf and hardcarry ROCCAT to victory. It wasn’t a pretty sight overall, and to make matters worse the Unicorns were trying to funnel resources into Exileh. Playing funneling comps requires an incredibly solid base, a stable foundation on which they can build upon. The Unicorns of Love don’t have that, so what they were doing experimenting is beyond anyone’s comprehension. That said, H2K showed even less. The Unicorns at least did something right overall, and they showed some signs of life. H2K was simply outclassed from the very get go. Betting on the Unicorns would be the better and more logical choice here. Schalke 04 vs. Splyce – Even though Schalke looked a lot better yesterday, it’s still too early to give them the benefit of the doubt. For every thing they did right, they made a dozen mistakes as well. It was far from a clean and dominant showing, but seeing how they’re still meshing as a five man unit, they’re surely satisfied to at least get the win. They’re coming into their own groove, but Splyce looked so damn impressive – it’s actually shocking. Sure, they demolished Team Liquid on the last day of Rift Rivals, but that could’ve been just a one-off thing. It wasn’t. It seems like they’re getting back to their Spring Split form sooner rather than later, and then some. They all played at an insanely high level, and it’ll be very interesting going forward to see if they can sustain this level of play and challenge the status quo. We’re going with Splyce on this one. Even though it’s still too early to predict their success further down the line, it’s hard not to be aboard the hype-train after they demolished Fnatic. G2 eSports vs. Giants Gaming – While it became obvious that G2 aren’t the best team in the region when not playing funneling comps, they didn’t really lose a lot of stock in their loss to Misfits. They had control of the game, they had the lead, they were more proactive and aggressive but a couple of individual mistakes sealed their fate. They also had a pretty iffy draft, not a lot of engage, Wunder couldn’t really do anything on Gangplank and Hjarnan’s poke wasn’t that influential either. Overall, they were lacking in their composition, and had they went for a different set of champions the outcome could’ve been different. As for Giants, it was yet another day and another defeat. They had some success, you have to give them that, they had the upper hand in the mid game but Schalke’s superior teamfighting eventually took over. Much like G2, Giants didn’t really move in any direction after their loss. They’re still an okay middle-of-the-pack team that has some potential, but they’re eons away from being able to compete with G2. Fnatic vs. ROCCAT – This is where things get a bit intense. Fnatic were heavily favored going into their clash against Splyce (a team that barely managed to scrap two wins in week three), and yet today they have another tough task – ROCCAT. Now, ROCCAT aren’t exactly world-beaters by any stretch of the imagination, but they’re extremely solid, and if they have a gold lead at fifteen minutes, they’re yet to lose this split. ROCCAT are fully aware of their strengths and weaknesses. They know they can play standard meta without any crazy cheese comps or funneling strats, and they’re doing what they can in order to win – and that’s playing to their strengths. Getting Memento ahead is objective number one, and they’re succeeding more often than not. Fnatic on the other hand failed to adapt to an aggressive, proactive Splyce yesterday. The way they played the game was a bit too fast for Fnatic which is pretty ironic. 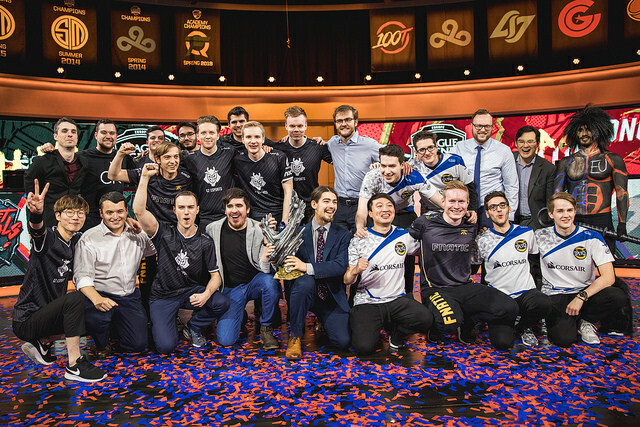 Everything went wrong for the Spring Split champions, their plays were sloppy and highly telegraphed and when they failed to impose their own playstyle they kind of just shut down and became incredibly reactive. Fnatic gave them an inch and Splyce took a mile. They’re still a very capable, highly dangerous team overall, but their play yesterday didn’t instill any confidence going forward. That said, they should still be more than able to take down ROCCAT, even on a bad day. They have the better players all-around and Broxah was always more than fit enough to counter Memento’s aggression. Team Vitality vs. Misfits – For our final match of the day, we have a repeat of the Spring Split third place match, and even though Misfits are heavily favored (and with good reason), it should still be a highly entertaining scrap, especially if Vitality come out of the gates swinging as they’re prone to do. Does Vitality have a chance? Not really. They’re very solid overall and they have the tools to make this into a very competitive scrap, but Misfits really showed no actual weakness. Sure, they’re not perfect, they make individual mistakes, but their drafting is excellent and they also have mental fortitude and resilience in spades so even if they make a couple of cardinal mistakes, they always have the tools to mount a comeback – like they did against G2. It was a slow and calculated game, but the fact that they were able to bounce back and beat G2 at their own game is exceptional. They never surrendered, they never let go, and they were fighting for any objective they could take on the map, waiting patiently for the time to strike. Misfits should have the edge in tomorrow’s match without a doubt.